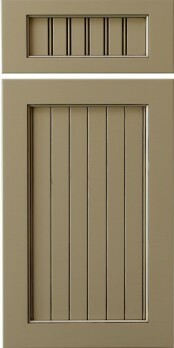 The Ardmore is a simple grooved panel door that features the G-015 rout & maintains a 1-1/2″ rout spacing (other spacing available upon request). For truly custom version of this door, add one of the available framing bead profiles. In order to optimize this simple door design for painted finishes, Conestoga (CWS) developed a five-piece, full MDF construction door, that uses mortise and tenon joinery and called it the Ardmore (MDF). If you are looking for a simple, yet customizable door for a painted finish, then look no further and consider the Ardmore (MDF).